"The model Xenakis utilised for the piece was that of light refracted through water, with the piano representing water and the brass portraying near blinding light, but this is no picture postcard representation. Splashy piano writing trickles everywhere with the power of 1000 simultaneous waterfalls. Underneath, muted brass enter imperceptibly until their reflection becomes a resonant reality, tidal waves of brass later overwhelm the piano as the two battle for supremacy. Another significant masterpiece is the Hebrew based N'Shima (1975) for two voices and instruments. The microtonal vocal writing is kept determinedly untamed for the niceties of the trained voice, and the clustery brass and amplified cello accompaniment equals their raw expressivity. 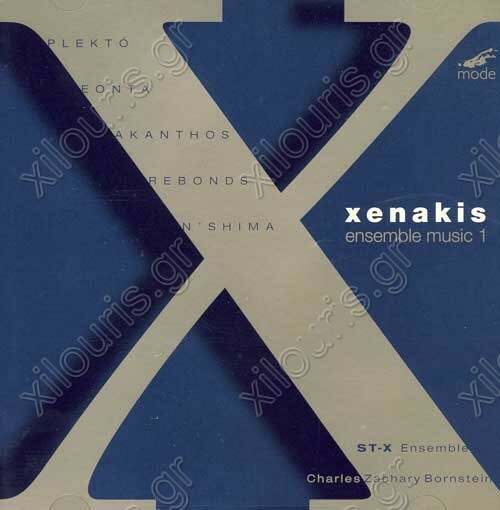 Then - rare in Xenakis - a joke, as a naked tonal fanfare in the ensemble appears without reason. Plekto (1993) is oddball again, featuring the pianist ricocheting clusters against a web of counterpoint from flute, clarinet, violin and cello. Xenakis usually locks counterpoint into his familiar sound masses, but here lines jut out provocatively. A mediating percussion part glues the whole raggedy enterprise together." 4. Rebonds, for solo percussion: "b"
5. Rebonds, for solo percussion: "a"